This is the default. 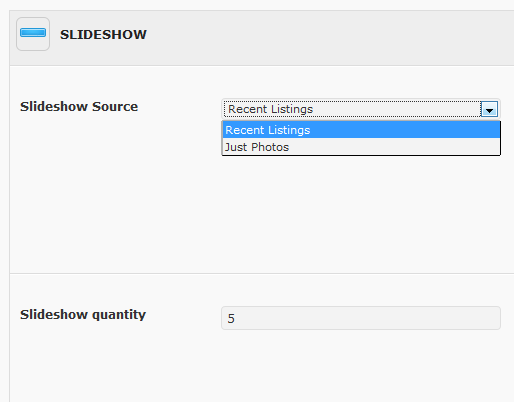 In Appearance ->Theme Options -> Slideshow, be sure the Slideshow Source setting is set to “Recent Listings”. The slideshow will get populated by recent Property Listings. When you create a Property Listing, be sure to set the “Include in Slideshow” setting to “Yes”. The Appearance ->Theme Options -> Slideshow, has settings for the slideshow transition type, quantity of slides to show, and more. In Appearance -> Theme Options ->Slideshow, be sure the Slideshow Source setting is set to “Just Photos”.